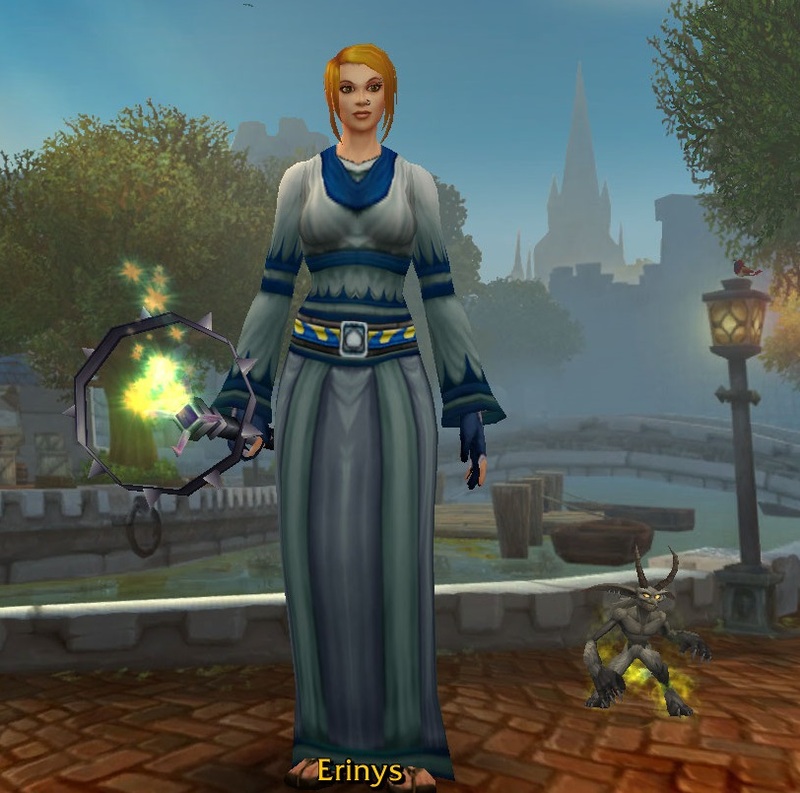 Hi my name is Erinys and I’m addicted to playing Druids. 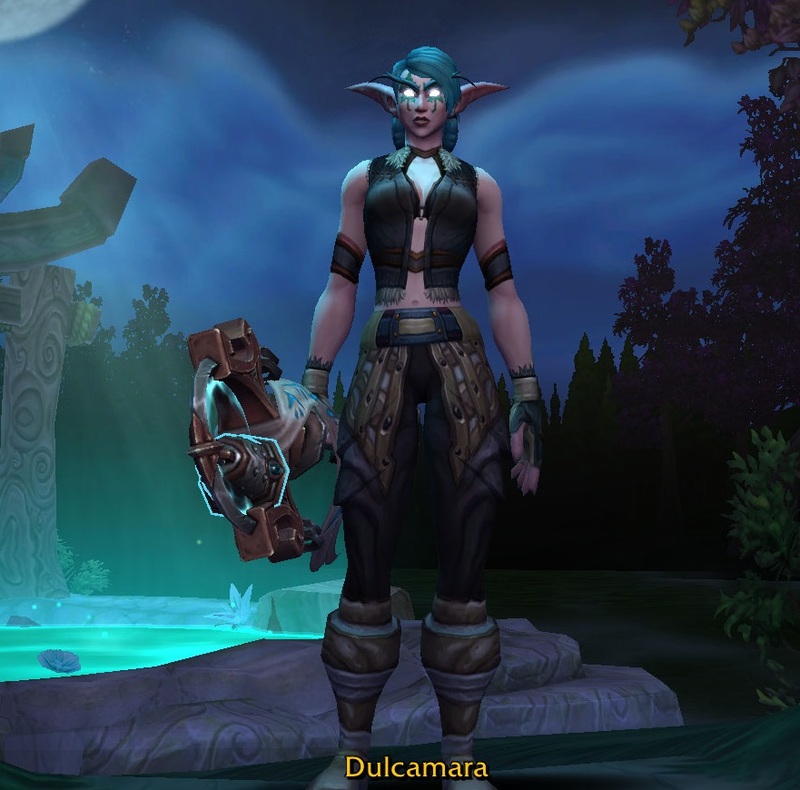 I didn’t realise quite how bad my problem was until I started taking screenshots for this post but it seems that Druids are one of my go to alt classes. Therefore in chronological order, I’d like to introduce you to my furry, feathered and often squawking friends. 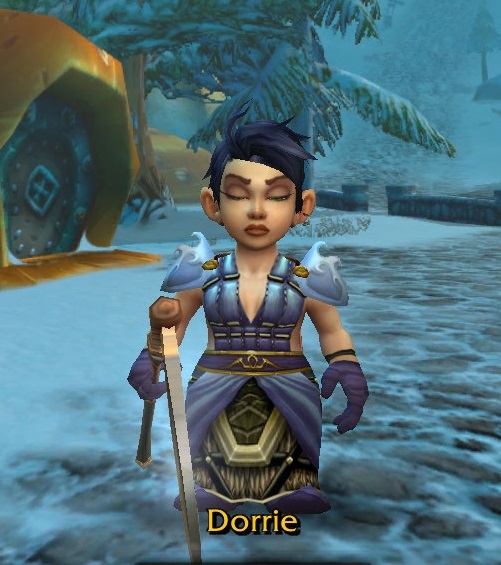 Briarrose senior was my third character to end game and she was born out of guild drama and general stress. 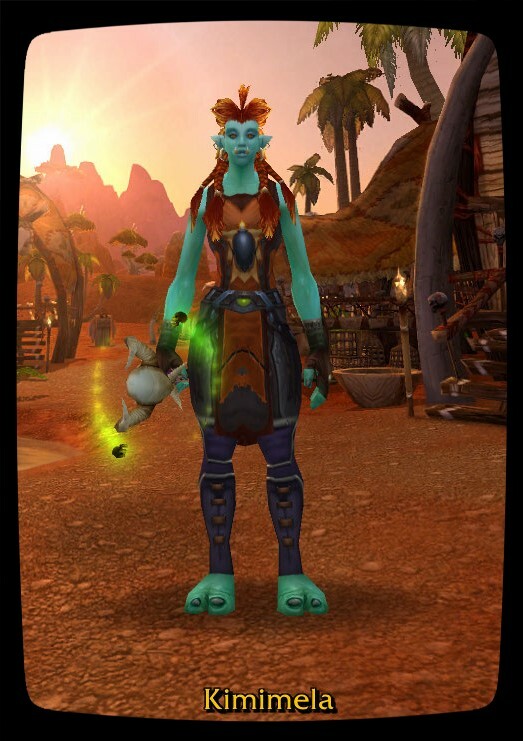 I wanted to spend time away from guild chat and what better way to do that than to level a character who wasn’t guilded. 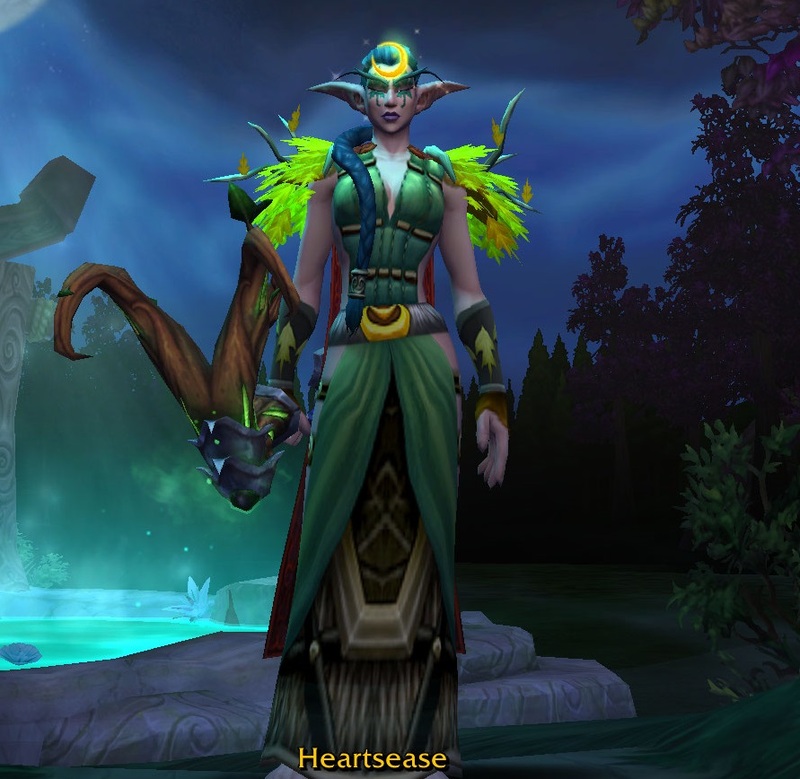 Mr Harpy already had two Druids at level 60 by this point (his first two characters) so I had a good understanding of the class and I loved being able to mix it up in pvp. 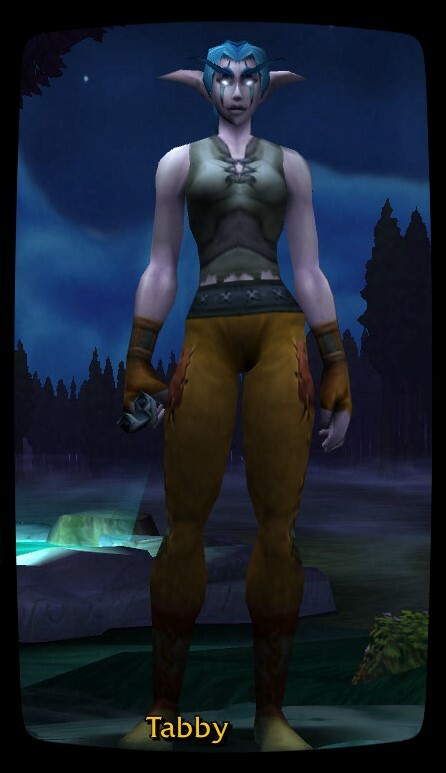 In fact my greatest moment in a battleground was probably the game in which when facing a same server Horde Premade, my little Druid held the Blacksmith against around seven decently geared and decently played Horde through abuse of feral charge, bear healing and sprinting off to heal up out of line of sight and bouncing back moonfiring. 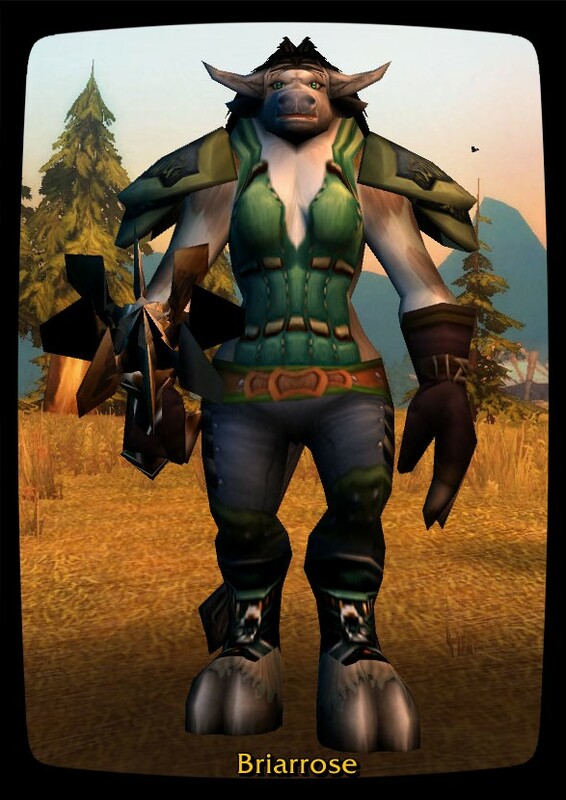 Briarrose the younger was my first ever Tauren and again dates back to “vanilla”. I have to admit I actually miss the original Tauren cat form (because I’m weird like that) and spent ages when they brought in the new colours trying to find a catform I found acceptable for her. Briarrose has been Feral for ever and will probably stay that way even though I’m not hugely taken with any of their catform alternatives. Tabby only reached level 10 and has spent the rest of her existence on a pretty much dead server. I don’t however have the heart to delete her. 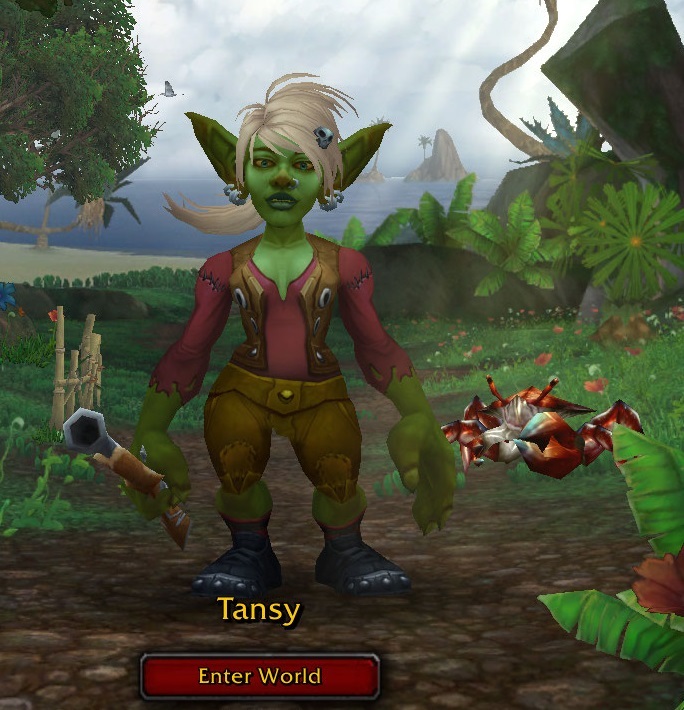 Tansy is a Moonkin and a ganker. Her hayday was in Wrath when she could bring squawk and awe justice from the skies to evil Horde. I think Cataclysm and then MoP pretty much broke her heart because it’s become impossible to slaughter someone as you fall past them with your parachute cloak up. 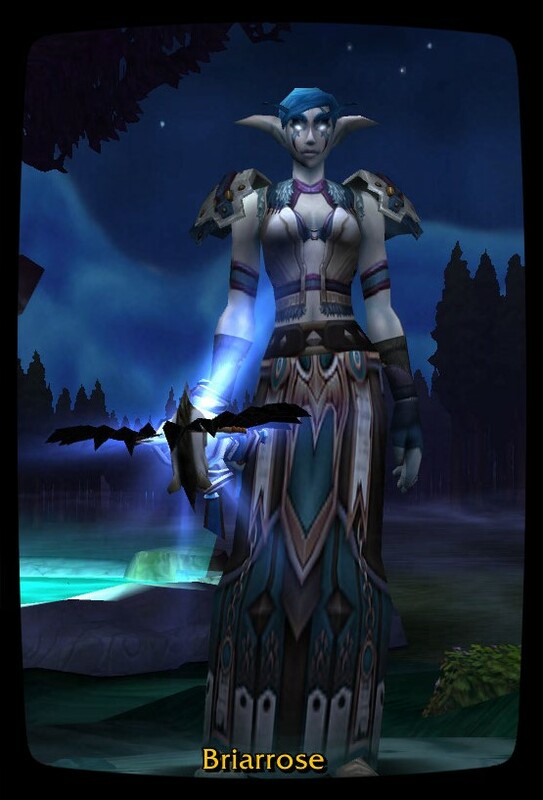 She was also rather fond of Wintergrasp even though the imbalanced population on her server made it “interesting”. My Troll Druid was made because everyone needs a Troll in their lives. She’s another Boomkin because moonfiring stuff, especially Gnomes and Goblins never gets old. Teasel is Resto through and through. That’s the way she leveled and whilst she does have dual spec, the second one is also Resto. 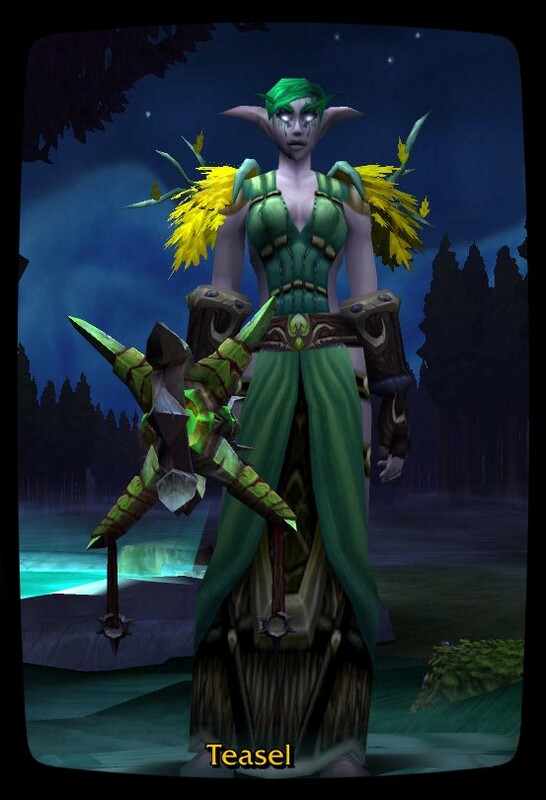 I have to admit though, had Treeform still existed as a permanent form, she might well have been another Moonkin. 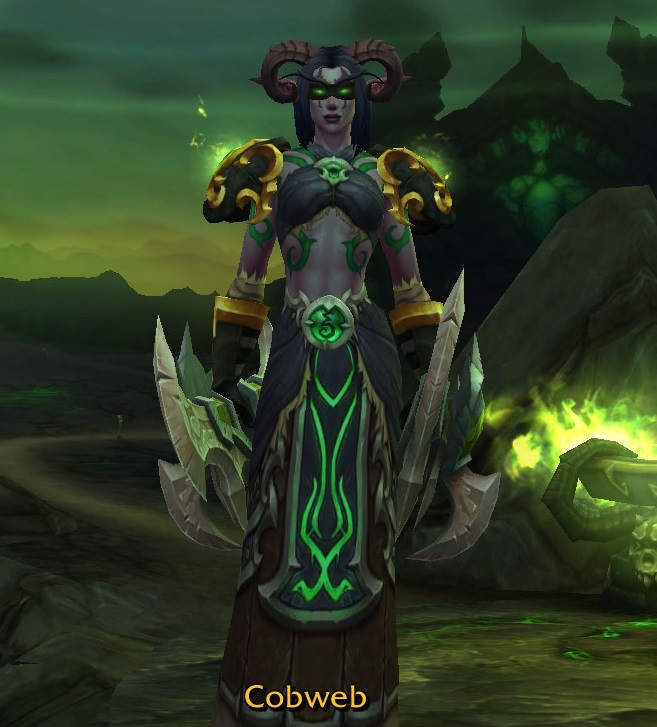 I leveled her towards the end of Cataclysm and primarily through PvP and it’s definitely been fun comparing her to my original Druid Briarrose. 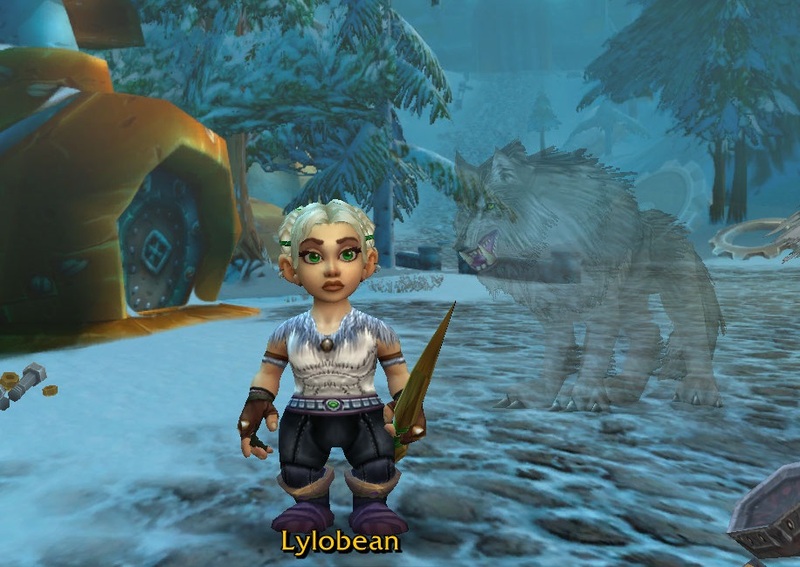 I miss feral charge as Resto for sure and also I don’t think the damage in cat/bear form scaled at all from where it was back then. Originally you could use cat/bear to kill in PvP saving your mana for healing, even against DPS classes if you did it right. I’d be very surprised if that was possible now. 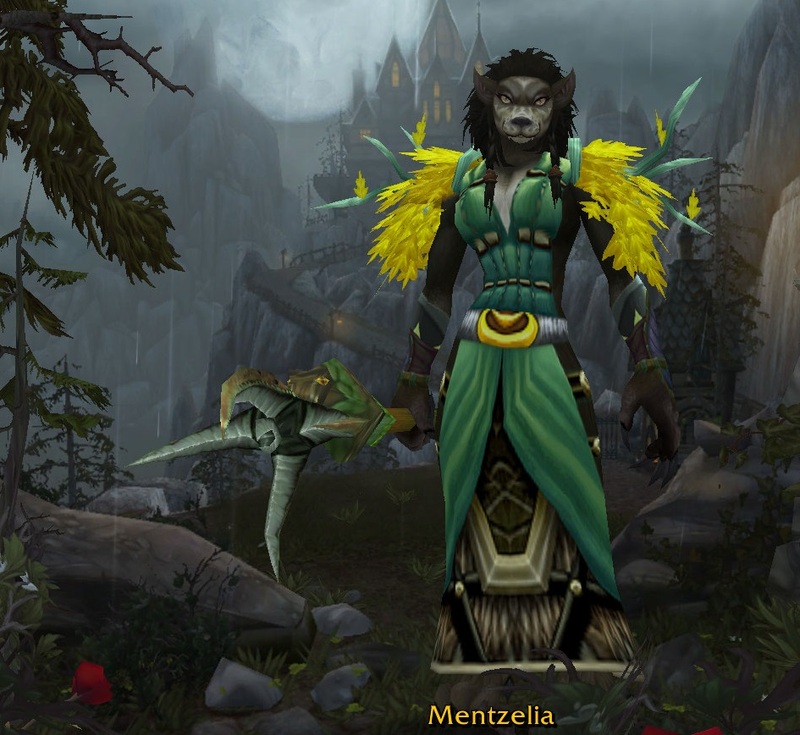 Finally my baby Worgen Druid, my Harvest Witch, Mentzelia. 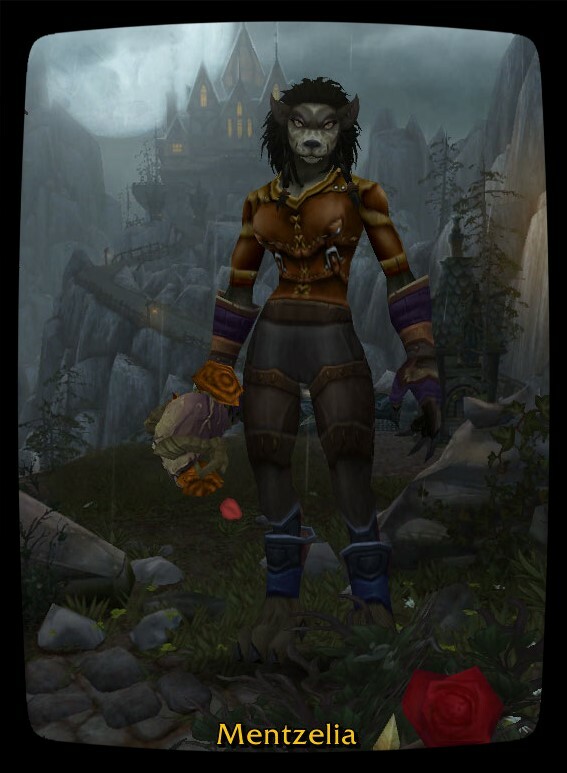 My plan for her (once she escapes Gilneas which she needs to do before Hallows End) is to level as Feral just because I haven’t done that for so long. 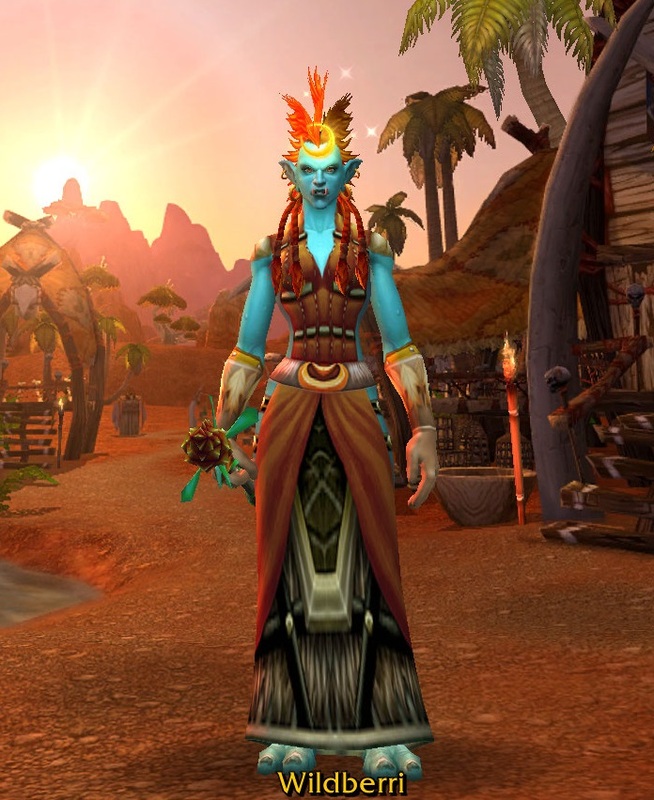 My goals for this week then are to make that final push to free Mentzelia and are to find a proper transmogrification for my little Tauren Briarrose. Cymre put up an interesting post a while back about the old AQ Gates quest chain which got me thinking about a couple of my favourite and now removed quest chains. Then when I was attempting to clear out my drafts folder I came across this. 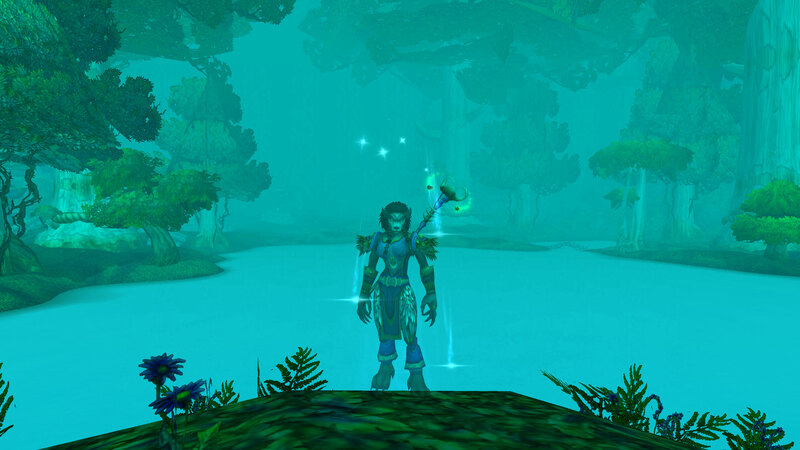 A post I started in November 2009 but never got around to finishing or publishing (before now) plus it is Druid week and thus ever so slightly relevant (at least the first paragraph is). 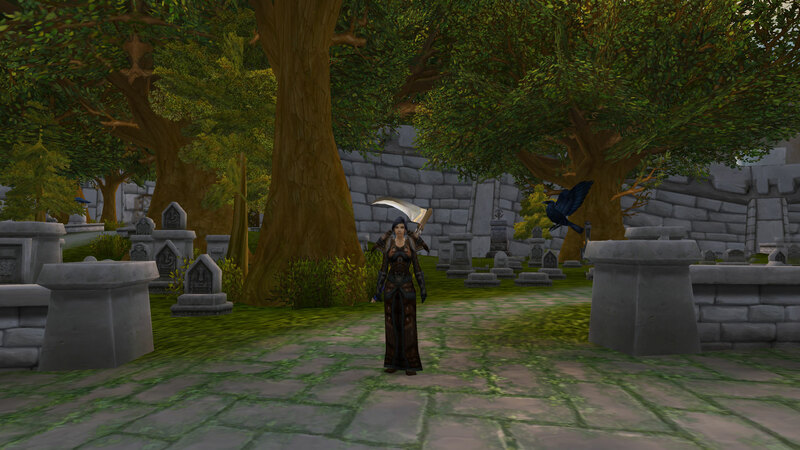 I’m currently re-running the Swift Flight form quest on my second druid. The experience has left me feeling a little saddened and humbled. Why aren’t there more of these awesome quests scattered through the game. 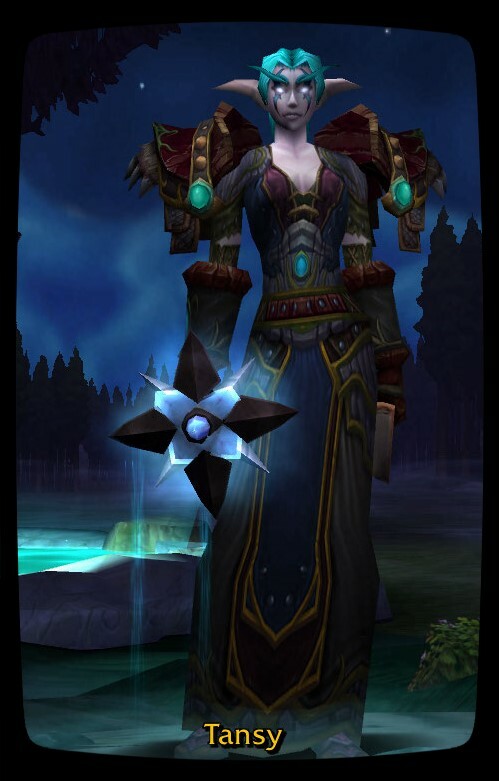 Why don’t all classes have the opportunity to discover more lore about their class? I had to use virtually all my spell book, from hibernate to cat form, to remove curse to moonfire. I visited places I’d never seen before, like the pink frosting masquerading as water outside the Barrow Dens and the river border of Azshara and Ashenvale. 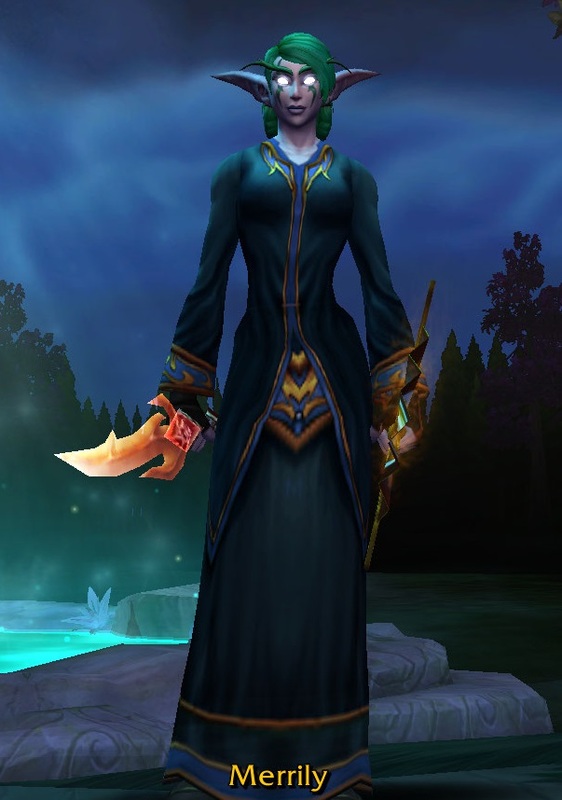 I came out of Sethekk Halls feeling like a proper grown up Druid. 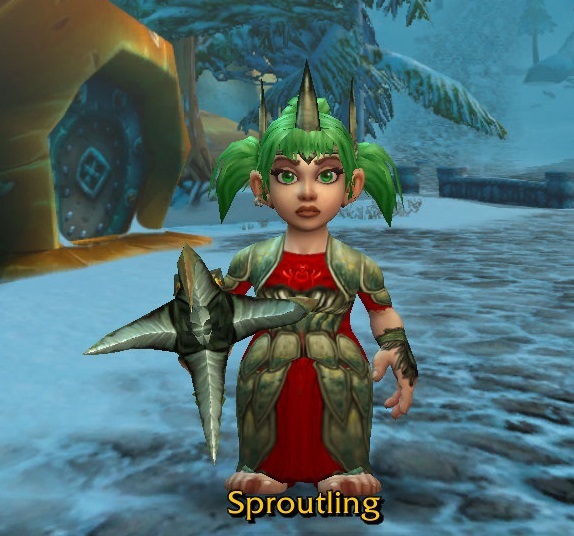 Back in Vanilla, I had the pleasure of doing the Benediction chain and I watched the Gnomeling do his Rhok’ledar (I was there for moral support and to kill any Horde who looked at him funny). Both were amazing chains but when you compare the Priest/Hunter epic chains to the Druid model, there are a couple of crucial differences. The Druid one doesn’t rely on RNG. I got lucky, my Eye dropped from our very first Majordomo “kill”. However I knew Priests who had to wait months for that chest to stop yielding leaves, conversely, my guild got Eye after Eye and so our Hunters were epic bowless. 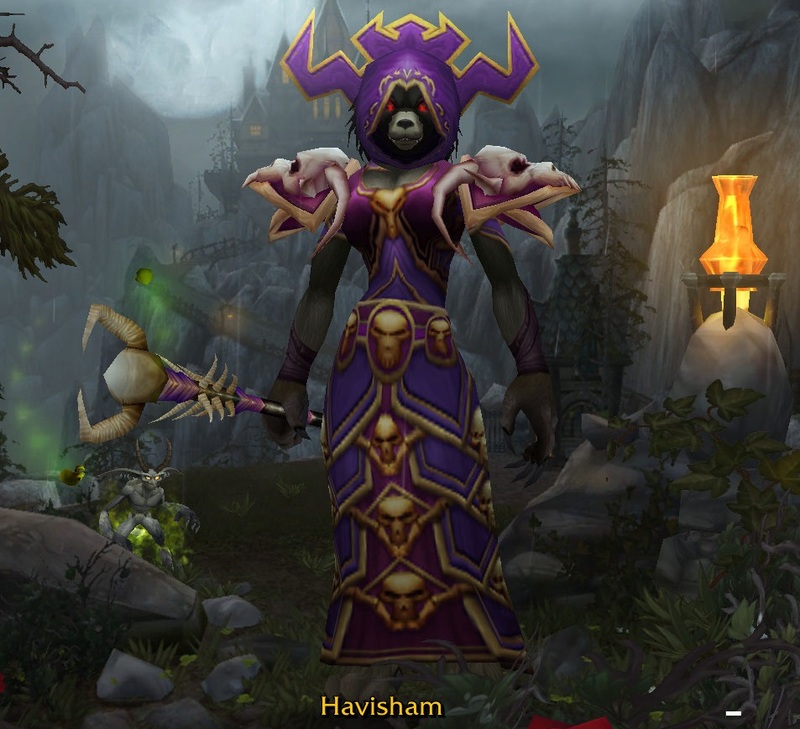 Putting the two parts that both Hunters/Priests needed on two different raid bosses meant that in order to experience your epic class quest you had to raid. For Priests especially, getting the Eye of Shadow on my server was hard. One guild (mine) tended to get 95 percent of all the Lord Kazzak kills and when you factored in the fact that we had something like 12 raiding priests and numerous priest alts, it took a while for them to filter onto the Auction House. 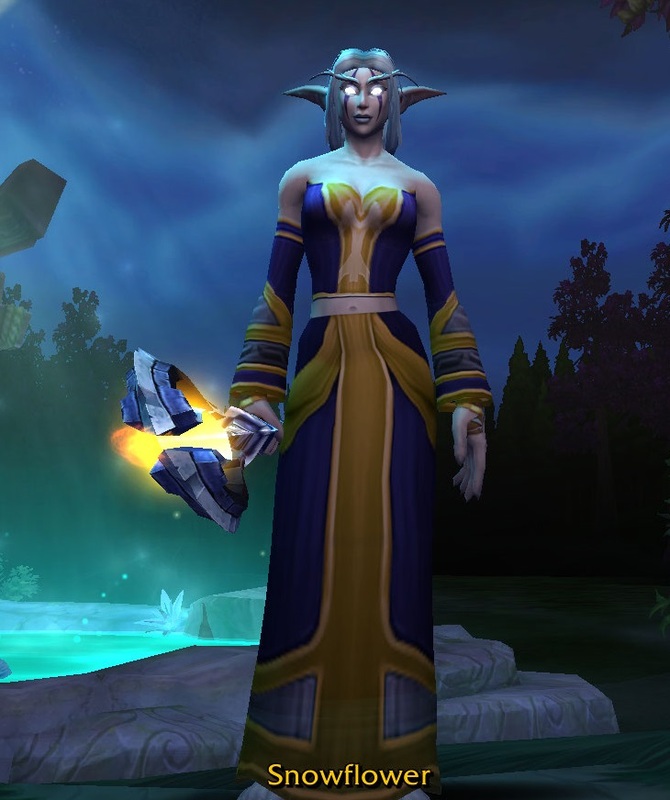 Yes, you could farm it from those horrible demons in Winterspring but doing so as a Priest solo was hard and the drop rate sucked. That’s actually how I got mine, farming with three other holy priests and a resto druid until 4am – roots, smite, smite, smite, smite, wrath, roots, smite, smite, smite, smite, roots, wrath, wrath, wrath and so on. Painful doesn’t even begin to describe the experience. To be fair we started out with a bunch of dpsers but they all went to bed early. Not sure if that was because they were bored or because they had to get up early in the morning and we healers soldiered on. 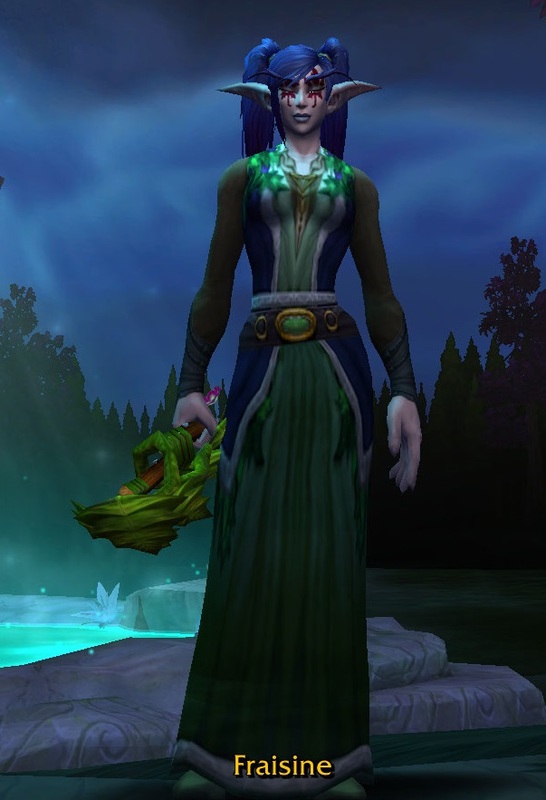 So if any future class quests were added, I think that Blizzard should follow the Druid model and make the chain easily available to anyone regardless of how they choose to spend their time in-game. Availability obviously has to impact on the reward, but the rewards could be cosmetic or fun or even powerful at the start of the expansion but wilt over time. If something is easily obtained by say all warriors willing to spend a few hours running quests and probably doing a dungeon or two, I can’t think of any reason why it couldn’t be comparable with the first tier of raid weapons. It would provide a different gearing path and help factor out RNG for people trying to get their first set of gear together. As for dealing with the different specs, Benediction/Anathema was an awesome way of doing that and it would be nice to see Blizzard implement that on other stuff. 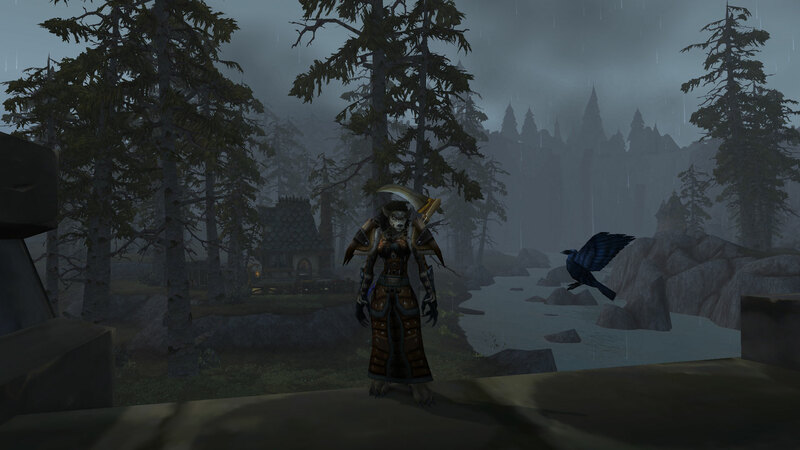 Which then got me thinking, Blizzard originally added quite a few class based zones. Think Ravenholdt hidden away in the hills, compete with its poison garden and staffed by persons of a dubious nature. Or Fray Island, the fight club of WoW where warriors would brawl to prove their worth and receive Berserker Stance. Then there is the Moonglade itself, the tranquil valley in which druids of both factions can meet, watched over by the Cenarion Circle. When Cataclysm rips a path through the world as we know it, WoW’s very own disaster movie, I really hope that areas like those get a bit more love. Also WTB a Priest hideout where Erinys can sip honeymint tea and debate the finer points of religion with other Priestly types. Although I suspect we might as well just rent a battleground or a graveyard because given the diversity of our faiths, someone is bound to end up dead. What I loved about all three of these quests was the fact that they made you think about what it meant to play that specific class. Not only in terms of playstyle although all three required you to explore your spell book, perhaps the Druid and Hunter more so than the Priest, although plenty of people I knew did take Holy Nova especially for the quest but also from an RP perspective if you wished to indulge it. With the Priest quest, you had to merge the dual nature of the class by acquiring both the eye of shadow and the eye of divinity before striking a balance between them. You have come for redemption, yet you yourself do not realize this… Do you? I never stated that you were here to redeem yourself, priest/priestess. You are here to redeem me and the innocents murdered while trying to escape Stratholme. My spirit and the spirit of those lost are bound here, cursed to endlessly relive our own tragic deaths. and consider the slate wiped clean. I really would love to see the quest chain added back into the game, possibly with the Eyes being available through the Black Market. I also loved the fact that you had to do it by yourself otherwise the “Cleaner” would come and squish you underfoot. Be warned, you must complete this task alone. It is recommended that your allies remain at a distance. Interference by outside agents will result in a most severe punishment. Although that plus the fact that Eris Havenfire would yell, alerting the entire zone Horde and Alliance alike that some brave Priest was attempting the quest did make it easier for the opposing side to grief. Therefore it probably doesn’t come as a huge surprise that the main aspect of the next patch which I’m really looking forward to is the “Proving Grounds”. Yes I’d rather have the storytelling and romance of class quests but given that Blizzard understandably wishes to design for the masses not a percentage, I’ll happily settle for that.